A gift from the heart to cherish and treasure. This Irish baby bible will make a grand Christening gift. 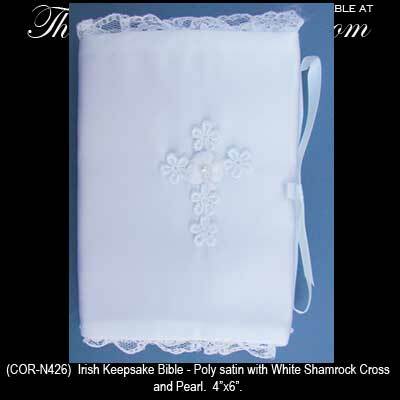 The Catholic edition bible features a poly satin cover that is enhanced with a Venice cross with a white on white shamrock and a faux pearl in the center. The Irish keepsake bible measures 4" wide x 5 3/4" tall and it is gift boxed with a shamrock history card, complements of The Irish Gift House.